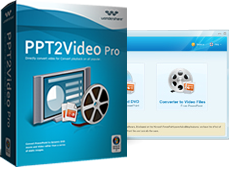 With PP2Video Pro, you can convert your PowerPoint presentation to iPhone compatible video format for viewing on iPhone anywhere, anytime at your convenience. It comes to be so easy to view presentation on portable device like iPhone. Convert PowerPoint presentations to MP4 video compatible with iPhone. Customize video resolutions: 320*180, 320*240, 480*270, 480*320, 640*480. WOW your audience by viewing PowerPoint on iPhone. Distribute PowerPoint presentation with students online and offline. Practice and review your presentations with ease on your iPhone. Extend the utilities of PowerPoint for marketing. Enthuse different user audiences about products and services. Add value to speeches and presentations and engage audiences during conferences, seminars and symposiums. Share PowerPoint photo slideshows of your holiday.